Stoletá kavárna is mentioned in Švejk's long anecdote that he tells Katz after the latter had played away his servant at cards. The game took place in a "hospoda" behind Stoletá kavárna and at the centre of events was the old plumber Vejvoda. Stoletá kavárna was a café with address Na Zderaze in Nové Město that existed from some time before 1887, but we don't know with certainty when it started and when it ceased operation. Early adverts show a certain Slavík as landlord. In 1908 these small adverts reveal that the landlord is Antonín Kolář and the address book from 1907 confirms him also as the owner of the building. See also Hospoda za Stoletou kavárnou. In 1909 the old building was demolished and a new one erected on the premises. Jaroslav Hašek surely knew both versions of the café, but the time of Vejvoda was probably before the rebuild. In 1914 they advertised for a piano player, the place was also a dance- and concert establishment. In 1915 the building changed hands after a bankruptcy and in 1916 it is referred to as the former café. By 1918 it appears to have reopened and in 1920 the landlord was B. Michálek. On the present building the inscription "Stoletá kavárna" is still visible. [1.14.1] Kominickej mistr byl už do banku dlužen přes půldruhého miliónu, uhlíř ze Zderazu asi milión, domovník ze Stoletý kavárny 800 000 korun, jeden medik přes dva milióny. Hospoda za Stoletou kavárnou is mentioned in Švejk's long anecdote that he tells Katz after the latter had played away his servant at cards. The gambling party took place in a "hospoda" behind Stoletá kavárna and at the story was centered around old Vejvoda. Hospoda za Stoletou kavárnou was most probably an inn that belonged to Josef Pavlíček. The pub was located at Na Zbořenci No. 7, two houses up the street from Stoletá kavárna. Pavlíček also owned the building, he bought it at a bankrupcy auction in 1904. The barracks of IR73 in Vršovice. Was it here that Lukáš trained One Year Volunteers? Einjährig-Freiwilligenschule (Prag) was the school where Lukáš was an instructor at the time he met Švejk. This is revealed when the author introduces Lukáš to the reader. The officer even tells his students: "Let us be Czechs but nobody needs to know about it. I am also Czech". The author also adds that all the students at the school were Czechs. The school is also mentioned later, for instance when he tells Wendler what he is doing and about his future plans. Einjährig-Freiwilligenschule (Prag) is the author's term for some reserve officer's school in Prague. These schools belonged to the individual regiments, but as it is never revealed at which regiment Lukáš served, it is impossible to know where the school was located. The next step in the investigation is therefore to look at which infantry regiments still had staff functions located in the city in the winter of 1914-15. Those were IR11, IR73 and IR102 and Lukáš surely served as an instructor with one of these (that he was transferred from Landwehr is unlikely). The description of the later dog theft does give some indication to where the school was located. Blahník dragged Fox in the direction of Vršovice, so it is logical to think that Lukáš lived there. Coupling this with the fact that Katy walked together with Švejk to the barracks where the officer taught, indicates IR73 and Vršovice kasárna. One should however be careful with taking the geographical logic of the plot literally. Later there is the episode where Lukáš went for a walk with the recently stolen dog Fox. He bumped into the real owner of the dog, colonel Kraus at Na Přikopě. This suggests that the officer lived for closer to the centre. Walking the dog all the way from Vršovice (3.5 km) seems improbable. In addition the author mentions that the students at the one-year volunteer schools were Czechs, whereas IR73 was a regiment where the overwhelming majority were Germans. On the other hand the barracks of IR102 and IR11 were located much closer (2 km), in Malá strána and Smíchov respectively. So if Lukáš lived within walking distance of one of these he wouldn't have had to walk that far to get to Na Přikopě. The literary figure Lukáš partly inspired by the real Sagner? The discussion about which school/regiment Lukáš instructed at is highly hypothetical because it is difficult to connect this part of the plot to any real persons or contemporary events. The author still hadn't aligned the story in the novel to that of his own career in K.u.k. Heer like he did from book two and onwards. Lukáš' main real life prototype, Rudolf Lukas, never served in Prague between 1911 and 1919. He did however teach one-year volunteers, but this was in Budějovice in 1911-12 and again in the autumn of 1914, that is before he met Jaroslav Hašek. Lukas served his entire career in K.u.k. Heer with IR91 so he could not have been transferred there like his literary counterpart was. Inspiration for his role as an instructor must therefore originate somewhere else, perhaps from some other officer hew knew. These could have been several, for instance Josef Adamička, but similarities with Čeněk Sagner springs to the fore. After a period of recuperation in Prague he volunteered as an instructor at IR11 while still being officially on sick leave. He started in this role on 25 January 1915 but because it was against the rules to serve at another regiment, he was called back to IR91 in Budějovice on 28 February 1915. Here he was appointed commander of the First Replacement Company..
At the time Jaroslav Hašek served with this very compnay and was also a student at the regiment's reserve officer's school. He therefore probably knew about Čeněk Sagner's position in Prague and also his transfer. A few more details about Lukáš also fit better with Sagner than with Lukas: Sagner was Czech and he is known to have stood up for the Czechs in K.u.k. Heer. On the contrary oberleutnant Rudolf Lukas was an ethnic German. Exactly like the literary figure Lukáš, Sagner was educated at K.u.k. Infanteriekadettenschule Prag, whereas Lukas was not. Thus we have three details on Lukáš that could have been inspired by Sagner but could NOT have been derived from Lukas. The term "one-year volunteer" has created some confusion. Jaroslav Hašek himself wore this label, and some have therefore concluded that he volunteered for army service *). This is as far as we know not true, and if it was he would also have been called Kriegs-Freiwilliger and not only Einjährig-Freiwilliger. *) An example of this misunderstanding is the article about Jaroslav Hašek in Spanish Wikipedia. Unfortunately this article also contains many other factual errors. One-year volunteer was an entitlement given to young men with middle and higher education. They had the option to serve for one year instead of the compulsory three (since 1912 two years), providing they paid for their own equipment. The system was created in 1868 modelled after Prussia and was functioning until 1918. The motive was that it would save the state money and wouldn't unduly damage the careers of the recruits. The "volunteer" part was also that soldier could (but didn't have to) attend a course to become a reserve officer during his term of service. Those who didn't pass the reserve officer's exam had to serve another year, but this duty was abolished in 1912. The one-year volunteer could also choose which branch of the armed forces and which unit he wanted to serve with. The one-year volunteer was expected to buy his own equipment whereas K.u.k. Militärärar provided accommodation (if the soldier wanted). Eligibility depended on the recruit having completed the eight year middle school (gymnasium, "Realschule", teacher's academy, commercial academy or similar). It was up to the candidate to apply for the right as a one-year volunteer, and everyone had to pass an exam. Someone who was sentenced for property crimes or immorality automatically lost the right to serve for one year. Thus Reserveoffizier-Schulen was an institution that educated one-year volunteers to become reserve officers. It may first appear that Jaroslav Hašek is wrong in using the terms "one-year volunteer school" or "school for one-year volunteers", but this is not the case. Until the army reforms of 1912 the schools were officially called Einjährig-Freiwilligenschule and obsolete term generally stick for years after the change has taken place (see Salmova ulice). [1.14.5] „Zažádal jsem o přeložení k 91. pluku do Budějovic, kam asi pojedu, jakmile budu hotov se školou jednoročáků. [1.15] Ukončiv vyučování ve škole jednoročních dobrovolníků, vyšel si nadporučík Lukáš na procházku s Maxem. Pohodnice Pankrác is mentioned when the author relates how unfortunate Lukáš had been with his servants. One of them had sold the senior lieutenant´s dog to the knacker at Pankrác. Pohodnice Pankrác was a "knacker's yard", i.e. a station for disposal of animal carcasses. It was also called a "Thermochemical station". The animal remains were mostly boiled to make fertilizers, bone flour and other residual products. Those were often used as ingredients in soap and glue. The enterprise was also allowed to collect dogs, cats and other stray animals from the eastern bank of the Vltava (a similar enterprise in Břevnov catered for the western bank). Prague city at the time defined stray dogs as "an animal that walked on its without a muzzle". The enterprises were licensed by the city, but privately owned and managed. The dogs were kept in a quarantine station at Vyšehrad until their owner reported and paid the fine for allowing his dog onto the street "improperly equipped". Dog owners had to claim their pets within three days, otherwise the animal would be destroyed. The carcass processing factory was located on the open fields between Dvorce-Podolí and Pankrác. The owner in 1912 was Rudolf Nešvara, so this is likely to be the person the author refers to as pohodný na Pankrác (the knacker at Pankrác). It is said that he was the nightmare of every dog owner in Prague. Nešvara's father Václav also ran the knacker's yard. He died 19 November 1888 at the age of forty, his father Antonín (1814-1894) and mother Marie both survived him. All in all four generations of Nešvaras ran carcass destruction enterprises in Prague, the latest was Rudolf's son Jaromír who was in business as late as during the Second World War. The yard had existed at least since 1888 and was operating until 1950, and the building lasted until around 1970 when it was demolished to make way for the new seat of Česká Televize. Nešrava and his undertaking is also the theme in the story Bei "Antouschek", dem Wasenmeister by the famous "raging reporter" Egon Erwin Kisch. The story was first printed in Bohemia on 27 November 1910, and was the 17th in his series called Prager Streifzüge. The story later appeared in books, including Aus Prager Gassen und Nächten (1912) and Abenteuer in Prag (1920). In the story Kisch describes a tour of the factory, his meeting with Herr Nešvara and he provides a number of details, both technical and also about the history and organisation of such enterprises in Prague. He also tells about his family and that his brother worked there. Kisch writes that the enterprise was relatively odourless, something that is at odds with the complaints that appeared in the inter-war years. [1.14.1] Kanárka mořili hladem, jeden sluha angorské kočce vyrazil jedno oko, stájový pinč byl od nich práskán na potkání a nakonec jeden z předchůdců Švejka odvedl chudáka na Pankrác k pohodnému, kde ho dal utratit, nelituje dát ze své kapsy deset korun. Oznámil potom prostě nadporučíkovi, že mu pes utekl na procházce, a druhý den už mašíroval s rotou na cvičiště. U Štupartů is mentioned by Švejk in a conversation with Lukáš when he describes how the cat devoured the Harz canary. I similar episode is said to have taken place in this house but in this case the cat had eaten a parrot. U Štupartů is a building in Staré Město with a history dating back to the 14th century. The house is named after Peter Stupart von Löwenthal who bought it 20 October 1664. His grandson sold it out of the family on 10 September 1732. In 1910 the house had two street addresses in Štupartská 14 og Jakubská 2 and had many tenants. Amongst them a the pub named after the house, run by Rudolf Holeček. It's address was Štupartská 14. The original building (surely this was the one mentioned in the novel) was demolished in the autumn of 1911 after much opposition. Klub za starou Prahou and others wanted to preserve it due to its historical and architectural value but they were overruled by the city council. Already in December that year the new building was under construction, was ready the next year and still occupies the premises. The builder was Josef Sochor from Prague VII. Another author who wrote about U Štupartů was Alois Jirásek, Jaroslav Hašek's teacher at the gymnasium in Žitná ulice. The novel "Temno" (Darkness) was first printed as a serial in Zlatá Praha and was published as a book in1914. It mentions the pub U Štupartů opposite the church Sv. Jakub as čertová krčma (a devil's inn). This historical novel is set at the beginning of the 18th century. Armin von Barheim was kennel in Bavaria. It enters the story when Švejk tells Lukáš about the finer details of dog breeding, and that one sometimes has to forge the pedigrees, because dog owners don't want mongrel dogs. Armin von Barheim is an institution which existence remains unidentified. No Bavarian kennel Armin von Barheim has been found, nor any kennel carrying this name anywhere in the world. Generic searches (Google and Wikipedia 2018) provide no meaningful hits, neither on geography nor people. Břetislav Hůla does list the kennel in his explanations to the novel (1951) but doesn't provide any complimentary details. Searches in the Bavarian, Austrian and Czech digital newspaper collections do however show up a few hits, but nothing that is related to dog breeding in Bavaria or anywhere else. All this indicates that the name Barheim is either invented or misspelt. [1.14.3] A každej hned chtěl rodokmen, tak jsem si musel dát rodokmeny natisknout a dělat z nějakýho košířskýho voříška, kerej se narodil v cihelně, nejčistokrevnějšího šlechtice z bavorskýho psince Armin von Barheim. Světová válka slovem i obrazem, s. 505: "Rakouský následník trůnu rozmlouvá se dvěma letci, sestřelivšími ruský aeroplan". Kronika světové války is mentioned when Švejk follows Katy to the barracks where Lukáš serves. There he has a chat with a soldier about the events of the war. He has an expression as stupid as can be seen on a picture in Kronika světové války where the Austrian successor to the throne appears in a conversation with two pilots who have shot down a Russian plane. Kronika světové války was not a book like the context here indicates, but sub-titles in the booklet series Světová válka slovem i obrazem (The World War in Words and Pictures) issued by the publisher Emil Šolc in Karlín from October 1914 onwards. They were published every two weeks and were later assembled in six large volumes. Editor in chief was Adolf Srb who was assisted by a group of experts. The series is richly illustrated, is very detailed and is generally of high quality. In total it contains nearly 2000 pages. Emil Šolc was also publisher of the weekly Český svět who printed the eventually well known picture of Jaroslav Hašek and Zdeněk Matěj Kuděj in female bathing gear. Šolc originated from Telč where he also acted as a publisher. In 1913 he bought the bookshop and publishing house of Rudolf Storch in Karlín. In 1919 the publishing house was merged with Nakladatelství Šimáček. It is obvious that Jaroslav Hašek used some of the instalments/books from the series as a source when he wrote the novel. The quote from Kronika světove války regarding the photo of the heir to the throne Karl Franz Joseph is copied letter by letter from volume II, page 505. It should be added that these brief daily reports appear also in periodicals like Národní politika and Roskvět, but with a slightly different spelling. Therefore everything indicates that the author used The World War in pictures and words, and not any of the others. In chapter 14 fragments from Kronika appear repeatedly. The first example is the Sultan awarding the German Emperor the war medal, then general Kusmanek who arrived in Kiev. The longest direct quote is however the sub-title of the picture of the heir to the throne. Then follows the conversation between Lukáš and hop trader Wendler when the latter arrives to fetch his wife. Here the officer lists a number of leading Turkish politicians and high ranking officers, and also three German officers serving the Ottoman Empire. Wendler retorts with a tirade about the hopeless situation for the hop business, and a number of spots from the front in Belgium and France appear. He assigns a brewery to most of them and the names are all found in Kronika's summary of war events from 24 March to 2 April 1915. Some additional phrases are recognizable but adapted to the novel's context. These place names, persons and text fragments are all found on pages 505 to 507 of Kronika. Further snippets appear on pages 508 to 511, but these are not from the brief daily updates. Instead they are from a longer article reporting on the Central Power's breakthrough by Dunajec on 2 May 1915, and on page 511 deliberations on Italy's entry in the war. [1.14.4] Jedině když již stáli u kasáren, Švejk vyzval mladou dámu, aby počkala, a dal se do hovoru s vojáky ve vratech o vojně, z čehož musela mít mladá dáma náramnou radost, poněvadž chodila nervosně po chodníku a tvářila se velice nešťastně, když viděla, že Švejk pokračuje ve svých výkladech s tak hloupým výrazem, jaký bylo možno vidět též na fotografii uveřejněné v té době v „Kronice světové války“: „Rakouský následník trůnu rozmlouvá se dvěma letci, sestřelivšími ruský aeroplán“. "Dünden Bugüne İstanbul Ansiklopedisi" 8 vol, İstanbul 1993-1995. The Turkish Parliament is mentioned by Lukáš when he tells Wendler that the chairman of the Turkish parliament, Hali Bey, has arrived in Vienna. The Turkish Parliament (or General Assembly - tr. Meclis-i Umûmî) was opened in 1876 and functioned until 1920. It was the first attempt of a representative system of government in the Ottoman Empire. It was however dissolved by the Sultan already in 1878 and only revived in 1908 after the Young Turk Revolution. The assembly consisted of two chambers, the Upper Chamber (Meclis-i Âyân) and the Lower Chamber (Meclis-i Mebusân). The Lower Chambers was made up of elected representatives, the Upper Chamber had its members picked by the Sultan. At the election in 1908 several parties were represented, with the Committee for Unity and Progress (Young Turks) as the largest group. Many nationalities had seats in the parliament: Turks, Arabs, Armenians, Albanians, Greeks, Slavs, Jews etc. The 1912 election was however won by the Committee with an overwhelming majority, after an election campaign where democratic rules were pushed to the side. The ethnic composition of the house remained much the same. After this election Halil Bey, the chairman of the Committee, was elected president of the lower chamber. In 1914 new elections were held, but after the losses in the Balkan Wars the Committee had in 1913 taken power through a coup and in 1914 they were the only party participating. On 13 May 1914 Emir Ali Paşa and Hüseyin Cahit Bey were elected vice presidents of the lower chamber. Halil Bey was at the same time re-elected as speaker of the house with 180 of the 181 votes. The last ever election to the parliament took place in 1919. Initialy (i.e. 1876) it assembled in the building designed for the Darülfünun, the predecessor of the University of Istanbul, but never used for that purpose. 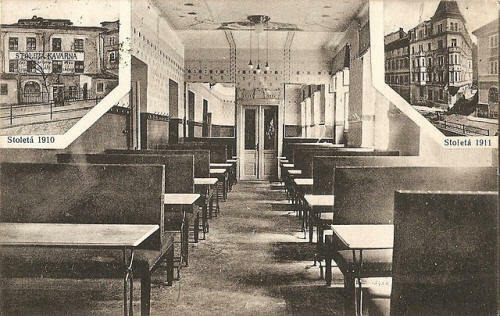 After the reopening in 1908 parliament assembled in Çırağan Sarayı on the Bosphorus, between Beşiktaş and Ortaköy (now Kempinski Çirağan Palace Hotel), which unfortunately burnt down two months later. After that the sessions were held in the Darülfünun building near Sultanahmet again. [1.14.5] „Turci se drží dobře,“ odpověděl nadporučík, uváděje ho opět ke stolu, „předseda turecké sněmovny Hali bej a Ali bej přijeli do Vídně.